Many of us know our children need immunizations, but many of us do not know at what ages the vaccines are needed. Immunizations prevent serious diseases and spreading those diseases to others. Doctor’s have found that due to Children’s immune system that vaccines will work best when they are given at certain ages of your children’s life because of the development of their immune system. Some vaccines do require several doses before the vaccine is complete and full immunization occurs and is effective. It is then important the vaccines are not given too close together. Missed immunizations can be “caught up” later if they have been missed, however, it is always best to stay on schedule. It is very important to maintain accurate records of your children’s immunizations. These records are required for daycare and school. Some minor side effects can occur with some vaccines such as swelling or irritation at the injection site. A low-grade fever is another side effect. Usually, any of these side effects can be prevented with a dosage of Tylenol or Ibuprofen before the vaccination is given. Vaccines today are regarded as an important part of your child’s health and very safe. 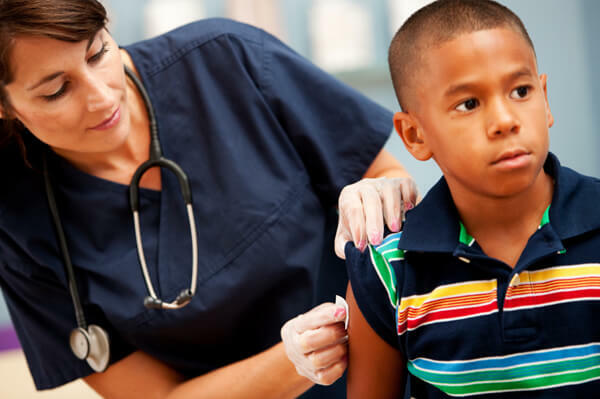 For a free helpful guide to Childhood Immunizations from the CDC, click on the link below.